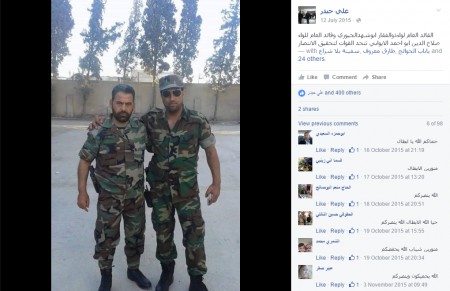 "The brigade, by which I mean Liwa Dhu al-Fiqar, has been incorporated under the cover of the Syrian state which has meant that the Secretary General for Liwa Dhu al-Fiqar Abu Shahed al-Juburi is the military commander for the Dir' al-Watan forces...in other words it is the case that Abu Shahed al-Juburi has assumed two roles in that at the same time, he is the Secretary General for Liwa Dhu al-Fiqar and the military commander for Liwa Dir' al-Watan...and the important issue is legal cover for Liwa Dhu al-Fiqar, having taken into account media criticism from those who fish in troubled waters, international criticism and the European Union that have asserted that there are Iraqi Shi'a militias fighting alongside Assad...Indeed both Quwat Dir' al-Watan and Liwa Dhu al-Fiqar are under the cover of the al-Bustan Association [owned by Rami Makhlouf]." However, it would be erroneous to assume that the devising of Liwa Dir' al-Watan on this basis came out of no prior groundwork. In fact, the branding of "Dir' al-Watan forces" (Quwat Dir' al-Watan) in relation to Liwa Dhu al-Fiqar goes back at least some months before the establishment of Liwa Dir' al-Watan. In this context comes the importance of noting prior coordination in this framework with pro-Assad Syrian militias in the Damascus area and the wider south. One of the units of relevance here is a militia known as Liwa Salah al-Din al-Ayyubi (The Salah al-Din al-Ayyubi Brigade), named for the famous Muslim commander who fought against the Crusaders. 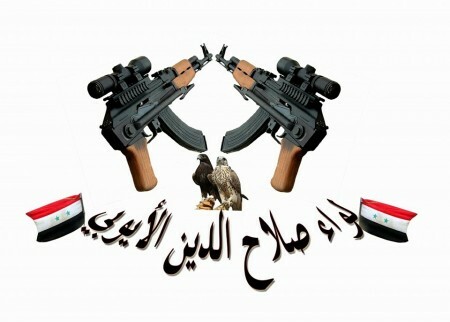 The militia, which also appears to advertise links with the al-Bustan Association, is led by one Abu Ahmad al-Ayyubi. Liwa Salah al-Din al-Ayyubi has claimed operations in a variety of areas including Zabadani, Jobar, Douma and Kfeir Yabous in the Damascus area, as well as Deir al-Adas in Deraa governorate. 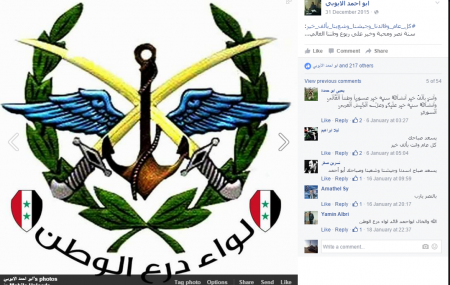 The group's use of the "Quwat Dir' al-Watan" brand goes back to at least March 2015, around the same time as theemergence of Liwa Suqur al-Quneitra, which also uses the moniker of "Quwat Dir' al-Watan." Note this post from Abu Ahmad al-Ayyubi suggesting links with Liwa Suqur al-Quneitra. Graffiti featuring Quwat Dir' al-Watan and Liwa Salah al-Din al-Ayyubi. Coordination between Liwa Dhu al-Fiqar and Liwa Salah al-Din al-Ayyubi is first mentioned in May 2015, and at the same time reference to Dir' al-Watan forces as led by Hayder al-Juburi begins to appear. This forms the basis for increasing references to Quwat Dir' al-Watan in connection with Hayder al-Juburi over the course of summer 2015 with a similar format to the promotion of posts from the Liwa Dir' al-Watan media office later in the year, as can be seen below. From a Liwa Dhu al-Fiqar account on 12 July 2015: "The general commander of Liwa Dhu al-Fiqar Abu Shahad al-Juburi and the general commander of Liwa Salah al-Din al-Ayyubi Abu Ahmad al-Ayyubi unite forces to realize victory." 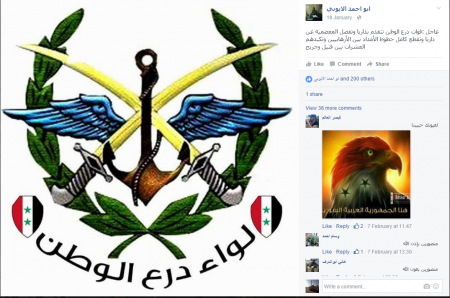 From a Liwa Dhu al-Fiqar account on 4 July 2015 (note the Quwat Dir' al-Watan logo): "As has happened now...Quwat Dir' al-Watan and the Syrian Arab Army liberate the al-Tal fortress in the Zabadani area with the killing of many armed men. 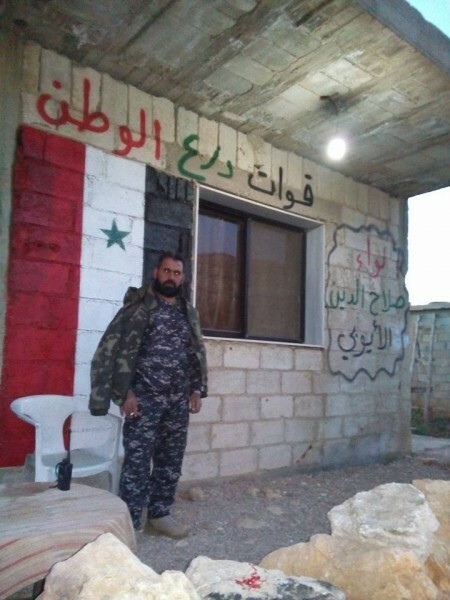 The Secretary General for Liwa Dhu al-Fiqar Abu Shahed al-Juburi confirmed to us that the men of Quwat Dir' al-Watan and the guardians of the abode- the men of the Syrian Arab Army- are now raising the flag in the al-Tal fortress and consolidating complete control over it. He added in confirmation for us that the men of God are continuing in the advance to liberate all the areas in which the armed men are present." Following the establishment of Liwa Dir' al-Watan, Abu Ahmad al-Ayyubi begins featuring a Liwa Dir' al-Watan graphic in certain postings: e.g. A post by Abu Ahmad al-Ayyubi from January 2016 (notice the interchange of Liwa Dir' al-Watan and Quwat Dir' al-Watan): "Breaking: Quwat Dir' al-Watan advances in Darayya, cuts off Moadhamiya from Darayya, cuts all the reinforcement lines between the terrorists and inflicts losses on them of dozens among killed and wounded." Thus, rather than thinking of Liwa Dir' al-Watan as an isolate entity that simply came into being in October 2015, it is more appropriate to see it as continuity and development from prior coordination and overlap between Liwa Dhu al-Fiqar and certain southern Syrian pro-Assad militias over a number of months under the label of Quwat Dir' al-Watan. In the grander scheme of things, it reflects a broader initiative to give a more acceptable 'Syrian face' to foreign militia involvement on the side of the Assad regime. This paradigm of analysis can be applied in a somewhat similar way to other pro-Assad militias like Liwa al-Sayyida Ruqayya and Quwat al-Ridha, both tied to foreign militias (the Iraqi Kata'ib Sayyid al-Shuhada' and the Lebanese Hezbollah respectively) but designed to recruit native Syrians (mostly Syrian Shi'a) and give a Syrian face to the concept of the "Islamic Resistance" (al-muqawama al-islamiya).